Difficult to make a choice? Need extra info or advice? Ask our specialists for advice. For stock information, special opening times and other information on Wild Gecko call the information line. Open 10hours a day, 6days a week (Mon-Sat.). Wild Gecko Shop is open from 10:00a.m. till 5:30 p.m.
Is it difficult to transport all your purchases yourself? No problem. You can have your goods delivered to your door. Placement & assembly services are also available. Transport and Assembly are supplied for a fee. Are you looking for a gift that appeals? Then give a Wild Gecko gift token / voucher in a nice gift package. Available from the counter at our shop. Help us to make Wild Gecko even better: Our customers are the most important thing for us. That's why we want to hear your opinion on our products and services. You can send your suggestion to info@wild-gecko.com. Or hand your suggestion in at our home store at Okponglo. Wild Gecko offers plenty of free parking spaces. At Wild Gecko you can pay with Master card and Visa. Of course you can also pay in cash. We will be happy to accept other currencies by arrangement. 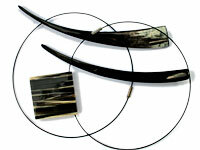 All Cow Horn Jewellery by Wild Gecko is hand-crafted, each piece determined by the unique properties of the different horns we use. At times the horn lends itself to straight, clean, linear forms; at others the natural fissures and imperfections of this beautiful material dictate more organic, fluid shapes. We mix and match different metals - hand-cast bronze, silver, glass - in our designs, from necklaces to rings, bracelets and earrings. The techniques we use can be traced back almost 300 years - but we pride ourselves on developing new, innovative ways of working this beautiful material provided by the African Longhorn Cow! When not wearing your cow horn pieces, wrap them up to prevent scratching. If they lose some of their shine through wear, rub with a little baby oil. Rubbing with Brasso polish also restores the shine. If kept in plastic, cow horn can develop a peculiar smell. This disappears in a short while when exposed to air! Findings are generally sterling silver, gold-plated silver and gold fill. The black-sheathed steel choker has a plated copper magnetic clasp. All findings are nickel-free.